The opening of the second facility in Damastown Industrial Estate, Mulhuddart represents a significant investment by Southern Tyre Recycling and enables it to provide a same-day nationwide waste tyre collection service. It has also led to the creation of four new jobs, bringing its overall number of staff to 12. “It’s a state-of-the-art recycling facility which we feel was needed in Dublin. It gives us a presence in both Dublin and Cork and gives us the scope to collect tyres anywhere in Ireland,” managing director Seamus Kelleher says. Founded in 2012, Southern Tyre Recycling specialises in responsible tyre disposal and recycling. Providing a reliable and fully compliant collection service, the company reprocesses car, truck, agricultural and earthmover tyres. 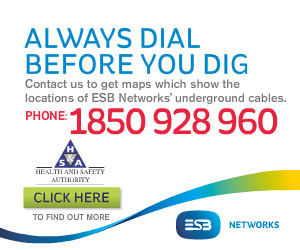 Its customer-base includes garages and tyre retail outlets, scrapyards, farms, local authority depots, industrial sites, household waste recycling centres and even the Irish Navy. Southern Tyre Recycling holds a full Waste Licence issued by the Environment Protection Agency in respect of its two purpose-built sites in Damastown Industrial Estate and Hollymount Industrial Estate, Hollyhill, Cork, and is also a member of Repak ELT, which was approved in November 2015 by the Minister for the Environment, Community and Local Government to operate the only waste tyre compliance scheme in Ireland. Customers are provided with all necessary Duty of Care documentation for every collection of waste and a full audit for all ensuing processes. The company has a modern fleet of collection vehicles, including three 18-tonne rigids (two Mercedes and one MAN), which allows it to efficiently pick up a wide variety of tyres and quantities from 20 to 20,000. “Our collection service offers a hassle-free, convenient and cost-effective means to dispose of your end-of-life tyres. Our distinctive fleet of collection vehicles is fully licenced to carry waste tyres, transporting them to our processing plants,” Seamus adds. Consisting of steel, fabric and rubber crumb components, tyres can be recycled into many different things, including building materials, school and office stationary, shoes, sports and recreational surfaces, cement kiln fuel, carpet underlay and garden mulch. Some of the tyres reprocessed by Southern Tyre Recycling are used to generate energy and electricity in India. “We shred and granulate tyres for a wide range of applications, including carpet underlay, road building, all-weather training areas for horses, playgrounds, rubber matting, sports pitches and renewable energy. We also supply tyre shred for fuel in the manufacture of cement. Southern Tyre Recycling is a sister company of Kelleher Tyres which Seamus formed 10 years ago to cater for a growing demand for budget tyre brands caused by the economic downturn. “I identified a niche in the market for value-for-money tyres after the recession hit. The construction sector which I had been working in had collapsed, so it was a case of ‘sink or swim’. I brought in the Toledo economy brand from China and Kelleher Tyres took off from there,” the 37-year-old entrepreneur recalls. Kelleher Tyres has since become Cork’s leading tyre provider with branches in Victoria Cross, Upper John Street, Albert Road, Ballincollig, Bandon and Mallow. The company’s helpful and knowledgeable staff are on hand to advise on its range of budget, mid-range and premium tyres. They will help find a tyre that suits your vehicle and your pocket. Seamus’ brothers Padraig, Colm and Michael are all involved in this end of the business. Kelleher Tyres’ head office in Victoria Cross incorporates Kelleher’s Auto Service which is one of the most modern garages in the country. Operating from a 6,000 sq. 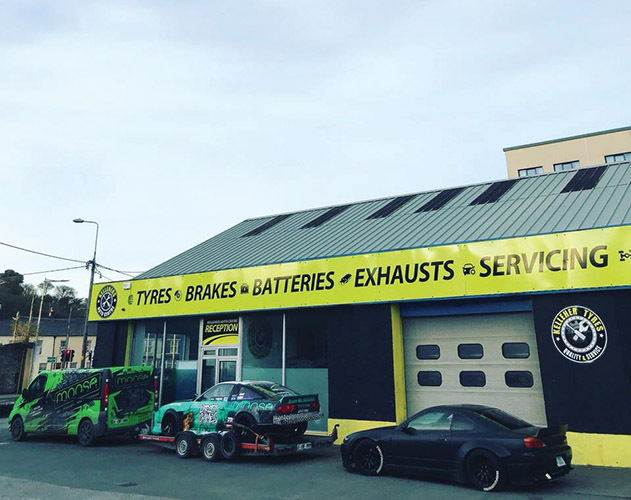 ft. purpose-built premises on a .6-acre site, Kelleher’s Auto Service provides everything from full servicing, NCT preparation, brake and clutch checks to 3D wheel alignment, battery checks and light focusing. Two years ago, Seamus opened a wholesale tyre business called Tyres 2 U which is the largest distributor of passenger car tyres in Munster. Also based in Hollymount Industrial Estate, the company prides itself on having one of the most comprehensive tyre ranges in the industry and is committed to delivering outstanding customer service. As a stockist of tyres from all the major manufacturers, Tyres 2 U offers a range from budget to premium. In addition, it supplies a number of private and exclusive brands that offer customers attractive dealer support packages to reward valued loyalty through benefits such as preferential purchasing prices, in-store marketing support, substantial margins and personalised rebate schemes.